Augie Jarecki and crew Billy Webber sail an X Boat in a youth race on Lake Beulah. 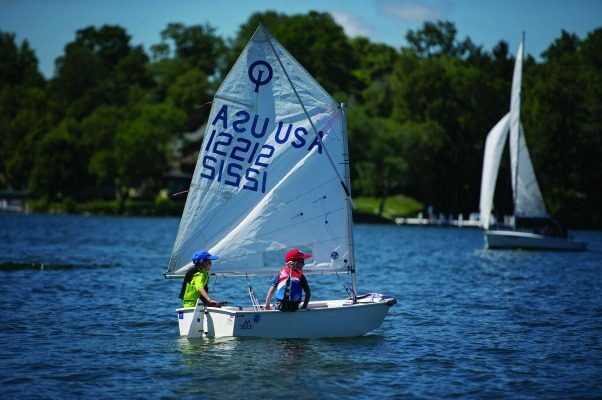 Younger kids take the "Learn to Sail" program on Lake Beulah in Optimist Dinghies. 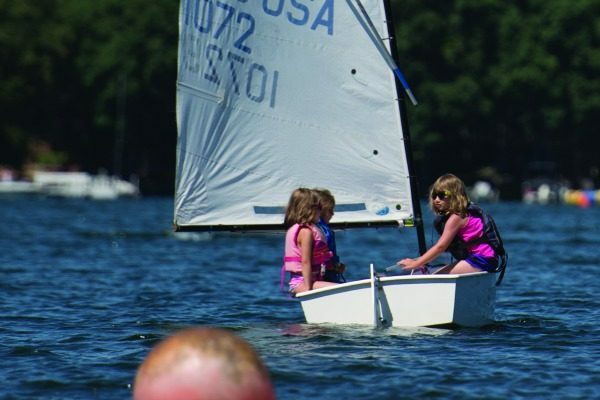 Located on a sleepy slice of lakefront, you’ll find a clubhouse, a dock and the Lake Beulah Sailing School. But appearances can be deceiving — this is no run-of-the-mill yacht club. It’s a place where trophy-winners, titleholders and even an Olympian first learned how to sail. The yacht club continues to churn out champion after champion, which could make many wonder: What is it about Lake Beulah that generates world-class sailors? According to Haeger, there are zigs and zags and challenges that make Lake Beulah an ideal lake for expert sailing. He says that although it’s not the “biggest lake in the world” at only 850 acres, and it’s not “big and round like a lot of good sailing lakes,” there are conditions that cultivate sailing skills. Founded in 1893, the five people who started Lake Beulah Yacht Club must have seen the potential the lake held for good sailing. By 1899, the club became popular among local residents, and membership rose to 34 families. In 1972, the club purchased the piece of land where the clubhouse now resides. Sailing classes began in the 50s, and in the early 70s, the decision was made to separate the Lake Beulah Yacht Club from the Sailing School, which now operates as its own 501(c)(3) organization and leases the clubhouse for their lessons. “Most of the sailing school members are also yacht club members, but you don’t have to be a member of the yacht club to have your kids go to the sailing school,” says Haeger. The sailing school offers a wide variety of lessons to both children as young as 6 and adults. They include: Optimist Dinghy Courses, X Boat “Cub” Courses and Learn To Sail Clinics geared toward adults. Nearly every student has a single goal in mind — to participate in one of Lake Beulah Yacht Club’s highly competitive races. The yacht club holds a staggering 200 races per season, in addition to four regattas. “The sailing school does the training and teaching. The yacht club sponsors the racing,” explains Haeger. The programming centers on four fleets: the C Fleet (“The largest boat we sail is called a C Scow. It’s a 20-foot high performance boat made for sailing on lakes,” says Haeger); the MC Fleet (“The MC Scow is a very similar boat, but it’s only 16 feet long and has a crew of one); the X Fleet (“A 16-foot junior trainer with a mainsail and a jib”); and the Opti Fleet (“The Optimist Dinghy is an 8-foot international youth boat”). Although there’s plenty of socializing, tennis and even some leisurely sailing among the yacht club’s almost 400 members, the highlight of sailing season is racing, with competitions on Saturday mornings and afternoons, Sunday mornings and Wednesday evenings. 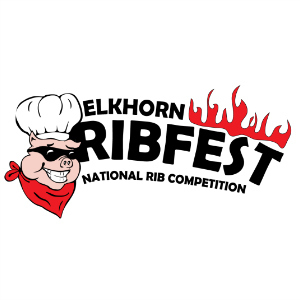 If there are members not racing, you can typically find them volunteering. 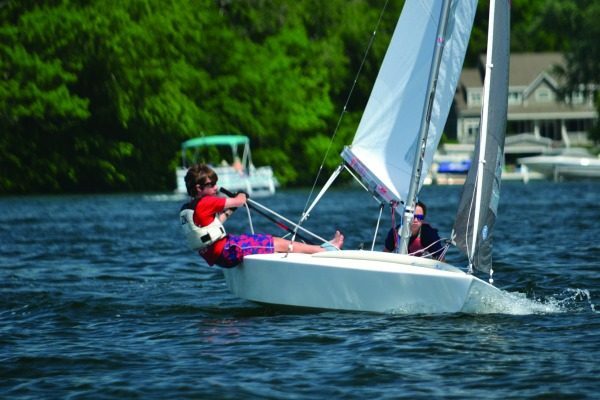 There will be four regattas taking place on Lake Beulah this year, including the sailing school’s OPTI regatta in June, an Inland Lakes Yachting Association Invitational Regatta for the MC class and two memorial regattas later in the season. Out of the hours upon hours of lessons, races and practicing, a fleet of prize-winning sailors has been born. Haeger explains that when people “started going to events off the lake” around Wisconsin and then “internationally,” that’s when the wins began to rack up. “We’ve had champions in all the classes that we sail in. We’re very proud of the sailors who have come from the yacht club,” he says. The yacht club has many members who are Wisconsin or Inland Lakes champions, as well as national champions in the C Scow and MC classes. Haeger says that the yacht club has enjoyed success through the National Points Championship, regularly taking first place in the C Scow class. Lake Beulah has also seen its share of internationally-acclaimed sailors, including Stephanie Roble who is currently campaigning for the 2020 Olympics and was previously named a Rolex Yachtswoman of the Year. Annie Haeger earned the same honor and competed in the 2016 Olympics in Rio (see sidebar). 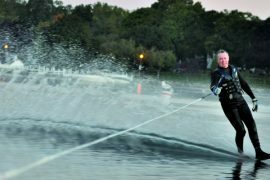 When Al Haeger purchased a home on Lake Beulah in 2001, he found that he was drawn to the yacht club. His grandfather bought a place on the lake in 1940, and Haeger’s two uncles were heavily involved in sailing. Continuing the family legacy, Haeger began sailing at age 53 and eventually moved into racing. “I’m just addicted to it,” he says. Many other yacht club members are just as enthusiastic about sailing. “It’s a sport you can do for your whole life. We have guys in their 80s that are racing,” says Haeger. 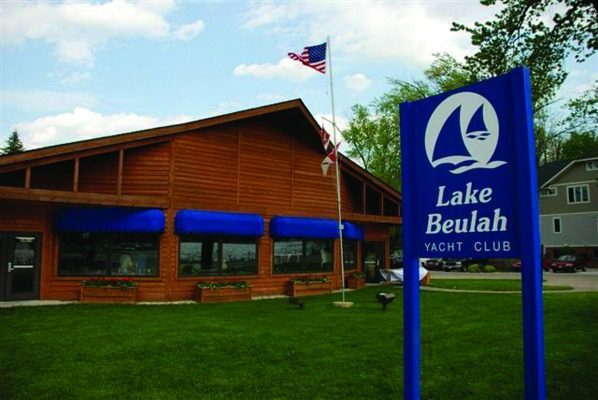 Lake Beulah Yacht Club has approximately 175 families, alongside single adults and youth, for a total of about 400 individual members. All of the members live on the lake or nearby. 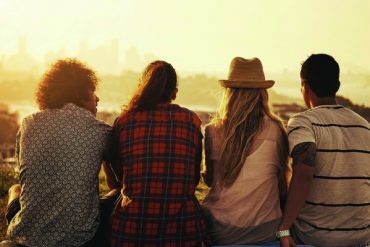 This gives the club members a close and constant connection. At the yacht club, members enjoy participating in races together, playing tennis on the club’s two clay courts, going to parties like the Memorial Day bash to kick off the season, a Commodore’s Ball and casual barbeques. Haeger even knows of four or five couples who grew up on the lake as kids, became yacht club members, got married and now have kids on the lake who are sailing. To the members of Lake Beulah Yacht Club, sailing is much more than sailing. It’s connecting. It’s challenging. And it’s gratifying. At 27, Annie Haeger has already made a lasting mark on the sailing world. 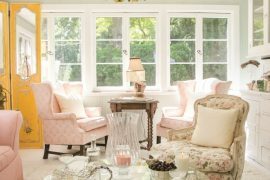 And it all started from her little corner of the world on Lake Beulah, where she spent childhood days sailing and spending time with her family. 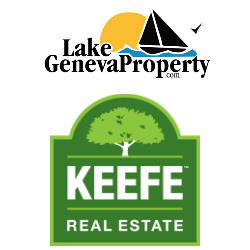 “My dad’s side of the family has been on Lake Beulah for four generations. On weekends in the summer, three generations of Haegers can still be seen racing, including my 81-year-old grandfather. 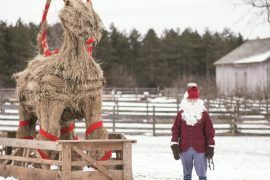 I guess you can say it’s a family affair,” she says. Annie took her first sailing class when she was 8. Although she says that the class was “not focused on developing Olympians, but rather creating an atmosphere to develop lifelong friendships and a love for the sport,” she was destined for the Olympics, where she competed in 2016. Even though she has entered the big pond of professional sailing, Annie says, “My heart will always be with Lake Beulah.” She tries to make it back to the yacht club as much as she can during the summer to sail on a lake that she says teaches one of the sport’s most important lessons: patience. Annie says that the yacht club is much more than a place where you learn to sail. During her Olympic campaign, she says that “people were coming out of the woodwork” to volunteer, share inspiring messages and plan fundraisers.